This past Thursday, the Indian Space Research Organization performed a crucial pad-abort test on their crew capsule spacecraft, a successful crewed launch of which would make India only the fourth country ever to independently launch a human into space, after the (late) Soviet Union, United States, and China. The test was designed to simulate an abort procedure that would require the crew capsule to be launched to safety in the event of something going very wrong with the launch vehicle. These sorts of systems have been in place on nearly all crewed spacecraft, with a few exceptions—NASA’s Space Shuttles didn’t use such a system, due to its size, and U.S. Gemini and USSR Vostok capsules used ejector seats. The system of four atmospheric guidance “grids” on the sides of the aerodynamic fairing over the capsule is quite similar to what the Soviet/Russian Soyuz spacecraft uses. Essentially, the ISRO system works pretty much like everyone’s does: a “tower” containing solid rocket boosters launches the capsule off and away from the rocket, and then the capsule uses its parachutes to perform a safe landing. 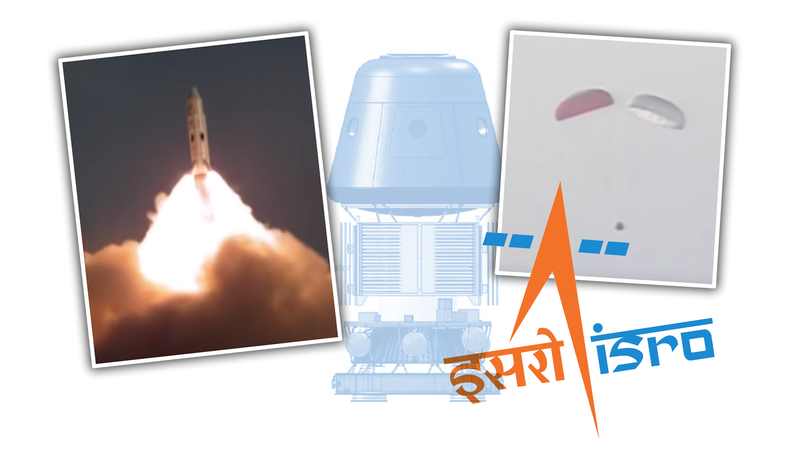 The best look we’ve gotten of the Indian crew capsule was from 2014, when ISRO launched a prototype capsule into a ballistic re-entry to test their heat shielding materials and systems. The capsule appears to be larger than a Soyuz or Shenzou return capsule, and a bit smaller than an Apollo capsule. The spacecraft design seems to be a two-module solution, like an Apollo capsule, as opposed to a three-module solution like a Soyuz or China’s Shenzou, which includes an orbital module in addition to a return module and a service module. Also more like Apollo than Soyuz is India’s plan to have their capsule splash down in water when returning to Earth, as opposed to landing on, well, land, like Soyuz and Shenzou. Plans and drawings suggest that the capsule will be capable of launching three crew, but a first launch is likely to have only two at the most. The abort test appears to have been successful, and the capsule design appears to be very advanced in development. The service/propulsion module has yet to be tested, and the planned launch vehicle for manned Indian Space Flights, a version of India’s Geosynchronous Satellite Launch Vehicle Mark III with indiginously-designed cryogenic engines, is still undergoing the process to become human-rated. I’m pretty confident India will become the fourth country to launch a human into space in the near future. Their program, while not widely known in the West or widely publicized in general, is nevertheless competent and appears to be quite reasonable in its goals and expectations, and is using very proven design concepts.